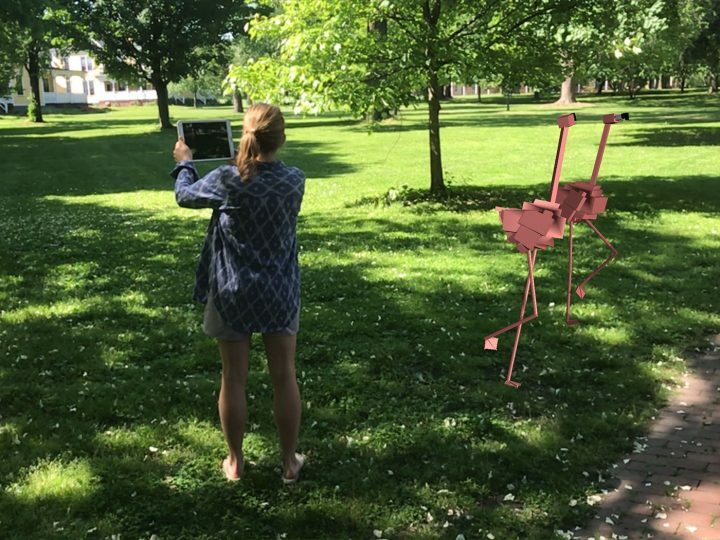 Flarmingos is an ongoing augmented reality project, on Governors Island in New York, in which artist Kristin Lucas asks people to join digital flamingos in a dance of ecological awareness. Inside Building 8A, Nolan Park on New York’s Governors Island, visitors are transformed into flamingos. A screen positioned over an old fireplace in a repurposed military officer’s home shows a flock of pink, strutting birds, their long legs marching in a synchronized dance. When a person steps in front of this screen, a new lanky bird joins the flock, which they control through movement. 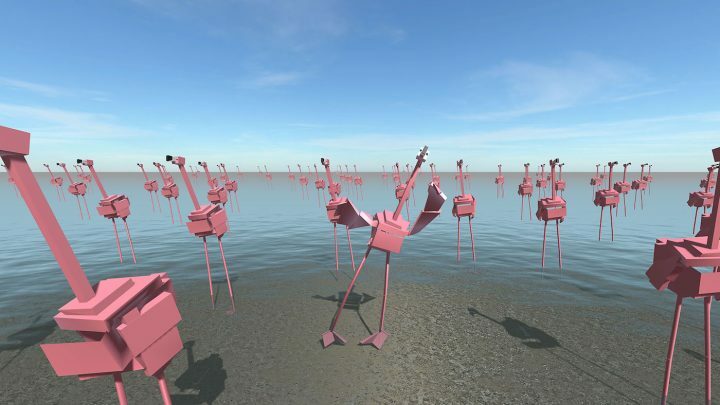 The digital promenading birds represent 20 wild flamingos that Lucas has adopted through the research institute Tour du Valat’s flamingo adoption program based in Arles, France. “I read that the larger the flamingo colony, the greater their chance of successful breeding,” Lucas said. 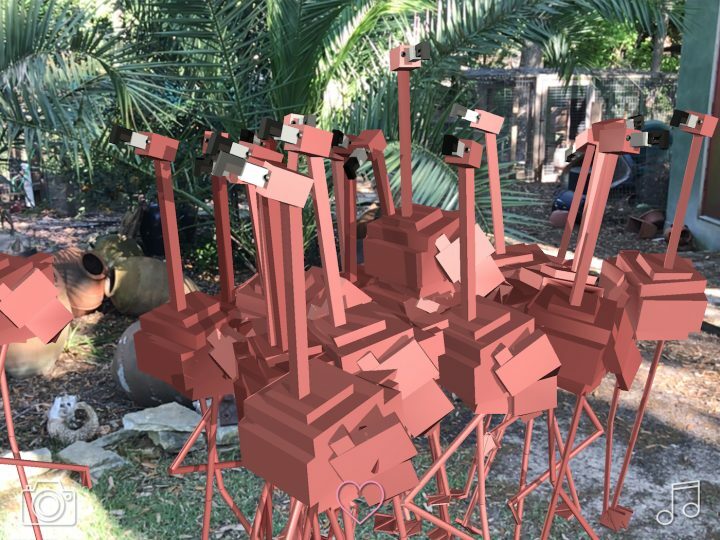 “My experiences invite humans to join a flamingo-led mating dance ritual and their presence increases the colony size.” In the recently released free iPhone and iPad Flarmingos app, which fills your world with life-size augmented reality flamingos, there’s an option to adopt a flamingo. Lucas has often used digital art and technology to question and enhance reality, particularly as it relates to the human body, whether legally changing her name to her own name in 2007 to refresh herself like a web page, or the interactive 2015 “Sole Soaker,” which involved a virtual environment with a roller coaster for pedestrians. The birds in Flarmingos are awkward, and oddly human, as they were animated through motion capture by Lucas. “Despite my efforts to move like a flamingo, my anatomy stood in the way,” she explained. “My legs bent [in] entirely the wrong direction and my relatively short neck, by comparison to a flamingo, prevented me from noodling into preening displays.” Yet behind their cartoonish shapes and cavorting is her real research into flamingos, with Lucas seeking out artist residencies near flamingo colonies, from Israel to Cassis, France, to Everglades National Park in Florida, and reaching out to ornithologists and conservationists for insight. She wasn’t always a flamingo aficionado. Her curiosity was sparked in 2015 while working on an exhibition in Gainesville, Florida. As she researched climate change projections, she learned that the delicate hypersaline ecosystems in which shorebirds thrive would be majorly impacted by rising sea levels. Through a series of residencies and grants she expanded this interest into digital projects that would act as a sort of interspecies connection, getting humans more in touch with these magnificent and strange creatures. 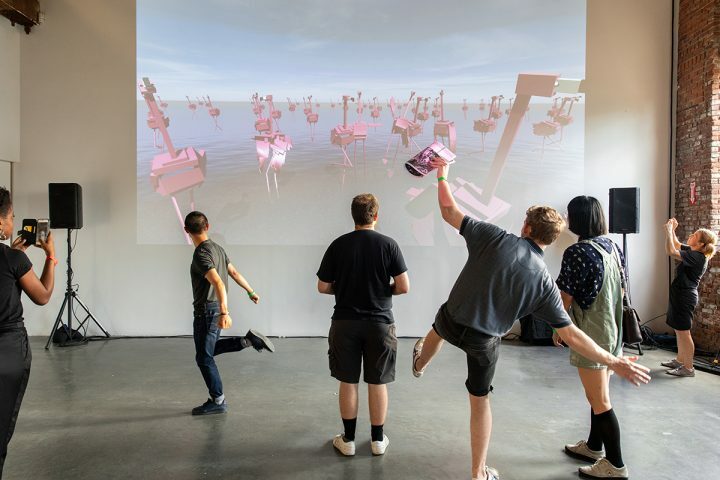 During a tech residency at Pioneer Works in Brooklyn, she worked with Tommy Martinez who programmed an AI flocking algorithm to animate the flamingo courtship displays. 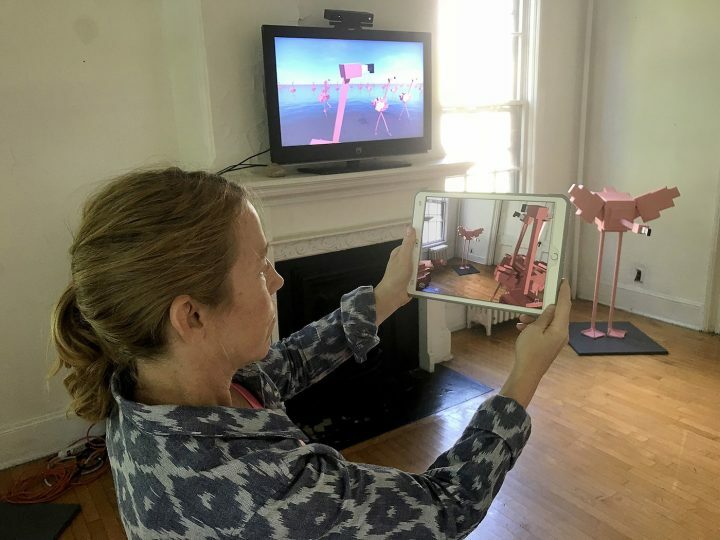 Through an Engadget Alternate Realities grant, she further experimented with HoloLens and iPads, premiering “Dance with flARmingos” as a mixed-reality experience in 2017, in which participants sniffed a wetland fragrance and explored details about banded wild flamingos, before joining the dance. It’s called the Lithium Triangle because it has most of the world’s lithium resources, an essential material in the lithium ion batteries which power the technology of Flarmingos. The mining of this material is threatening the survival of the Andean flamingo. Soon, Lucas plans to incorporate this issue into the project, alongside future additions such as a fall update to the app that will allow for multiple users to join flocks together, as well as a shared reality installation of Flarmingos coming to the Cinekid Festival in Amsterdam this October. “flARmingo Stopover” by Kristin Lucas is on view through October 21 at Harvestworks on Governors Island (Nolan Park Building 8a, Governors Island, New York Harbor).